Dynamic charts are like my favorite food, Mangoes. They tempt, tease and taste awesomely. In this post, we are going to learn how to create a dynamic chart using check boxes and formulas. Are you ready for some excel chart cooking? First get your data. Make sure its clean and arranged neatly, like below, in the range B4:E11. Since our data has 3 series (sales, profits and number of customers), we will take 3 check boxes and place them somewhere on our worksheet. Now, we want the check boxes to tell whether to show or hide a particular series of data in the chart. So, link each check box to one cell, say C13, D13 and E13. Finally, make a chart with the data in this new table you created. Put everything together and neatly arrange with your favorite colors and labels. Serve hot and see your boss drool. You can download FREE dynamic chart template and serve it instantly. Do you use dynamic charts? I like dynamic charts a lot. They provide a wealth of information in a compact form. I use them whenever possible, especially in dashboards and analytical outputs. What about you? Do you use dynamic charts often? What techniques do you use when implementing dynamic charts? Share your experience and tips using comments. Small suggestion: Sales and margins share a similar scale (or should share). However number of customers are of completely different order of magnitude. So, make the line chart use a Secondary Y-axis instead of sharing it with sales and profits. @Subhash.. agree. The number of customers should be on a secondary axis for clarity. A very simple and very good idea. I liked it a lot. Thanks for sharing. Awesome, just changed my current KPI reporting format to this style of dynamic chart for a customer. For Excel newbies this is an impressive tool but simple for them to use as well. Hey Chandoo, nice functionality in chart. I have removed the text from checkboxes completely and then added text box (insert ribbon) and colored it. To make the clicks work, I just re-sized checkboxes' width to overlap the text box. Tricky! Thanks for the explanation - that explains it! As many other posts about dashboards analytics that I read with pleasure, thanks for sharing this simple but efficient excel tip! While the Chart works well, adding a legend is tricky. Unable to remove say no. of customers once unchecked. Your charts are simple but easy to read - I've learned a lot about designing information from just reading your posts let alone doing the tutorials. Great tip! If one wanted to hide the reference table (or the "similar table"), what is the best way to do it? Move the graph to a separate tab? Hide the similar table? Nice trick. My boss would be confused as to the chart being a stacked or a100% overlapping bar chart. I almost never use 100% overlapping because of this confusion. Though by toggling it is so obvious that they are not stacked, but print out a graph with profit and sales and the confusion would be there. Simple and Brilliant. I was just thinking of making it for one of my presentations and here I got it, readymade!!!!!!!. Apologies for asking what I'm sure is a very basic question, but it's something I can't quite get a handle on. How exactly do you create the type of combined column design in this example? ie with the sales & profit columns appearing together. Is it a stacked column chart? I use Excel 2003 and I can't seem to match this design. Many thanks. so simple and yet so cool. Thx for the tip, I was a the moment building the same kind of graphics but didn't think to use the check boxes. It's clever. However the "linked cell" (don't know the name in the english Excel version) has to use the True/False format. How can we change that ? I used a simple y/n (yes/no)format in front of a group of lines I want to hide or not. It is much more simple to use. But I think the Tru/Falese format is automatically implemented in Excel and we can't use something else except some trick involving macro ; and I can't use it since I have to run the file on both Mac and PC. However to import data from various worksheets I use offset. The various formulas I use are as follows to get an idea. e.g. The chart will have its own data worksheet. The data for various departments may be stored on different worksheets and pulled as per the dropdown selection. 1. To pull data on the data worksheet... =indirect(address(row(),column(),,,$A$1)) where A1 contains the name of the worksheet. 2. xValues = Index(Data!$D$1:$D$10,A1):index(data$!D$1:$d$10,A2) where a1 and A2 contain the indexes of selected months from the dropdown. 3. yValues1 = Offset(xvalues,0,A4), yValues2 =Offset(xValues,0,A5) etc.. again this comes from the categories you select. Congrats on your fantastic site. I've the same query as Malachi. How can you create the overlapping column design that you have here in Excel 2003? I thought I was pretty good at Excel until I tried this. Am I missing something obvious? That's a Clustered Column chart by the way. Thanks Hui. Really appreciate that. It worked a treat. I tried copying the dynamic chart in excel 2003 by changing input data but the sheet is protected. can you walk me through creating a new list? @LDAllen... I do not think the sheet is protected. Can you pls. clarify? love this chart. I managed all the way to get it set up in excel, but how do I get it into powerpoint with the option that the check boxes are still working? @Anne... Thank you ... Powerpoint is another beast. I do not any reasonable way to port this chart in to ppt with all the dynamism. You should try embedding the whole workbook in to ppt. That way, during the presentation, you can double click on the excel object to open the chart from excel directly and show the interactivity. I just wanted to share that I used the ideas in this dynamic chart to create a comparison chart for our commissioning dept. There are 17 PCTs (health groups) in our region, so I have set up 2 charts - monthly and cumulative - so that they can choose up to 3 PCTs to chart and compare. They love it and think I'm fantastic!! Thank you Chandoo. I am enrolled in the latest school and hope I can wow them with more innovative ideas! @KateB: Wow, I am so happy for you. Welcome to the class btw. You rock! I just used it for a budget analysis I'm building, worked like a charm. Hi Jignesh, after you've added the check box, right click it and go to properties. then either type in the cell reference, or click the box at the end and click on the link cell. Does that make sense? Great...Thanks KateB 🙂 it worked. Thanks a ton Chandoo, had a presentation w/ my CRO this morning and used this technique to track large deals for the last 4 quarters, and yes you were right, they were drooling over it.. Keep on doing the good work, really appreciate it..
Hi, Chandoo. Thank you for this tip - it's incredible! I'm using this with a clustered column chart. My series are fiscal years 2006-2010, with the months along the horizontal axis. I was wondering if there's a way to eliminate the gaps for years that have been de-selected - for example, I may want to compare data from FY 2006 and FY 2010, and I'd like to see these next to each other in the chart; however, when I de-select FYs 2007. 2008, and 2009, I'm left with a chart that has a sizable gap between the two selected series. Using Auto Filter works, but it's not dynamic - when I re-select a fiscal year (say I now want to show 2006, 2008, and 2010, so I re-select 2008), I have to re-select the year in the Auto Filter's drop-down boxes. 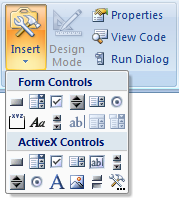 Is there a way in Excel 2007 to have these rows hide and unhide automatically when you select/de-select a check box? But pls tell me, from where you picked this chart i.e. Standard types or Custom types. I am using office 2003. I mean in the above exmple the one which is used, overlapping bar-chart with line. What is the name of the type? Can you upload a sample excel sheet with the formula you mentioned above? can u help me with a VBA to extract data from a URL and dump in a set file location within a give time schedule. Hey chandoo,I work for Nabler Web Solutions and i was thinking of using the same in my next report. I have tried making this dynamic chart, but i am not getting any success in that. Every time i try to make it the bars in my chart changes. Can you tell me how have you keep the length of those bars fixed. @Shrey... Welcome to Chandoo.org, thanks for your comments. you need to set axis min and max to fixed values. Select vertical axis, goto format axis (right click) and then choose fixed for min and max of axis and enter 0 and a large value (based on your data). This should do the trick. I am new to your website and I love excel but get very discouraged when it comes to using formalas and manipulating different functions. But this one was very beginner friendly. Now, I am excited to learn more. Thank you! I am adding a data label, excel is showing #N/A at the bottom which is not looking good. So is there any way to have individual data labels ? Thanks for sharing it. Very simple and easy to understand. I used this technique and it was very impressive. One question, is there any option by which we can use dynamic chart in ppt?? Also had the same doubt that Abhishek Sinha asked about the data labels..
Chandoo, I love this website. It was suggested to me by some of my MBA classmates and it is simply fantastic. I am so happy to have found this site! Thank you Chandoo. I have a question: My data has daily prices, for multiple years, of different metals. I have recreated the dynamic chart explained above, but now I'd like to be able to select specific year, month, or number of days, and have the charts update instantly. Please help! Thank you. This was very helpful.It helped me in presenting my data in a nice way in office.At the end of the meeting,people were impressed with my chart.Thanks. Its awesome info you provided and i checked the excel file after downloading. Will be a regular visitor in your site from now. I use Excel on a day to day basis; so I find your tips very valuable. The tutorial is so easy to follow and the outcome is fantastic. I had a great time trying it out. Thanks for these tips; I will definitely apply the things I learned from your site to make awesome and professional looking report. Thank you for giving us this project and to all of the others who explained the extra steps involved (@Hui.. & @KateB). I will surely amaze my colleagues as soon as I get a chance to use this technique at work! Hey Chandoo, such charts makes your work alive. But I have a confusion. what to do if we want to compare sales of 2 quarters in this same data. For example, sales of November and march for year 2003. Rest all is same.Then how will we link two cells with one check box. I really love to get here by google!! 😀 Almost literaly you save my life!!! It's a good trick!! Tnx lots and lots!! Thanks Hui for the reply! Well actually I accidentally solved it when I remove the legends since I can use the checkboxes as my legends (better that way too). But in any case, I have uploaded in the link below, so you can have a look at the problem if you want. Great you solved the problem, as the link isn't working ? I need help in getting the different chart types as I implemented every check box i have the same graph for every attribute. can you help me get different chart types for each attribute. I'm puzzled over that too. Each checkbox is currently formatted to show the same type of chart and i don't see anything on the Checkbox options to change that. if you click on the chart itself and then click "Change Chart Types" and then click on Templates, you can see that there are 3 templates saved (2 column and 1 Line), but they don't seem to be linked correctly as the line chart does not display. I have followed all the above steps correctly but it does not work. Why could this be? Point 3) Now, we want the check boxes to tell whether to show or hide a particular series of data in the chart. So, link each check box to one cell, say C13, D13 and E13. Great little file - thanks! I am just trying to manipulate it, but am having some issues. 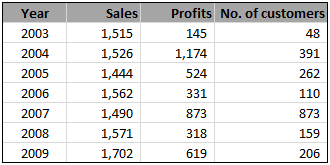 I am trying to break-down the sales and profits by each business unit (but keeping the year as well). I am new to excel and have seen the above dynamic chart. When i followed the instructions i get graph only when i select profit but dont get graphs for sales and customers, please help me in learning how to get graphs when select/tick on other options aswell. Now, how to get something like this into powerpoint so when infront of clients I can change that graphs being displayed while remaining in the powerpoint presentation?!?! HELP! Can you explain this formula?=IF(C$13,C5,NA()). and when i click on check boxes the data doesnot disappear frm the chart it shows NA. Quick question: I have created a chart just like this, and I was wondering if it would be possible to add a dropdown menu in the chart that would let me focus on only a single months worth of data. You had another tutorial that sort of explained this, I just couldn't figure out how to make it work with this. Thanks man...I feel so awsome today...actually was bored sitting in front of the Idiot box, so started surfing and stumbled upon this..
and when i click on check boxes everything works file except that data label comes as N/A. How you create sales and profits metrics in one bar. But I am getting stuck at the last part of process. How do you create this kind of "all in one chart" from the data table?? Hi, I wanted to know how I can upload this site on to a website. Google gives you an embed code so we can put that in a report and publish it. But how does it work for this particular chart on top using excel. Hello Chandoo & Other Dynamic Chart Users! Thanks for the tutorial. It works great and looking forward to showing off. The instructions were easy to read and implement. 1.) I have two columns and one line in my chart. All of my data is based on the calendar year, so data today forward does not exist yet. Therefore the line runs on the X axis for the remaining year. Is there a way where no data (=IF populates zero) values do not appear on the chart? To describe better, my line illustrates the actual values from JAN - JUL then falls to zero and runs the X axis for AUG - DEC. I'd like to have nothing there until the actual data is populated. I hope this makes sense what I am trying to describe. 2.) In my example, the line on the chart is based on data for a particular region. I have three regions that I'd like to use the dynamic chart with check box feature (my checkboxes are not in the printed dashboard, but are in the worksheet and data entry section on worksheet.) However, the legend shows all items even when not checked, therefore sort of "junking up" the real estate and showing the audience that there are other items available but aren't being shared with this particular audience. Is it possible to have the legend only visible as it relates to the check box? For example, the legend would only show the line that is checked? I've rambled quite a bit. Thanks for reading and hope to hear some suggestions from all the great Chandoo users. Good evening! How does one remove the labels- "Sales", "Profits" & "No. of Customers" from the check boxes. Just right click on the check box, edit text and remove the labels. Is there any way to shift the 'No of Customers' to the secondary axis (maybe, on the RHS) so that a bit more clarity. I prepared in the same way but all three sets of data are showing in same chart. 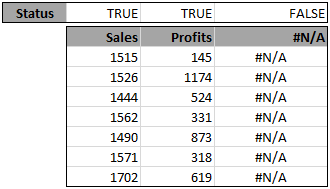 Eg - Sales, profit and Year are coming in bar graph, how to show two sets of value in bar and one in line graph. I am waiting....Can someone please tell me how to create a 2-in-1 chart such as both column & line added over here. I am using pivot charts, are these charts better than pivot ones ? Is there any provision to check that how may times i have worked on xyz excel sheet in a month? Excel as no built in Audit functionality which allows this. I have created a similar graphic but I would like to know if there is a way to just allow the user to select on check box at the time in order to avoid select more than one. Thanks! and the way to setup the radio button is the same as check box? Thanks! but I´m still can´t run the buttoms as I need. How can I share my workbook? Please include all steps, difficulty level, and reasoning behind each formula (etc.) for each example that your website provides. Thanks! Hello, nice article. I have a question, when I try to do it i can't erase the nº customer line when is not selected, it always appears in the bottom as if the result is zero. How can I make to make it dissappear at all when not selected? Thank you in advance. Great web, following! How do I change it so that the secondary axis only shows up when I check # of customers? I did practise how to do this, but I am not able to bring in different chart types. Thanks a lot for the tip. It is very useful. I would like to know only one thing.. when I create the chart and uncheck sales..I get N/A in place of the sales value. What can I do so that I will avoid the N/A? Is there a way to do this with a pivot table. This works great for looking at a complete set of data. I want to setup a workbook that will be added to periodically. I have setup of pivot chart that allows you to select by check box a number of selections but it always wants to sum everyting and chart one line. I would just like to say that your dynamic charts are fabulous. I'm working on a project and they have been invaluable, thank you so much!!! Sorry for what may seem like a basic question but you lost me at step #4. How does one "load" the new table with formulas. When i create and insert IF formula on the new table everything turns to "NA"
Any help with step 4? First of all hats off to you man. You are doing marvelous work. I am learning from your site. Regarding this dynamic chart, I have a small question if that can be done in power point? You know all analysis and data are presented mainly in power point slides and I was thinking if it could be possible to execute same charts with checkboxes in power point that will be great. Please advise if it can directly be done or through a macro, etc. But I want little difference and I don't know how to do it. I want to make the charts appear separately- next to each other. If I am selecting sales the chart must appear and now if I am selecting Sales and Profits both, both the chart must appear next to each other. This is wonderful, shows the power of excel. To do or achieve this with other applications would cost a fortune. Who then says Excel will go into extinction when there's no application today that does not at one point import or export from Excel? HI chandoo! I'm a fresh grad who was recently hired as an accounting staff. My office mates are awesome in excel, so here I am, trying to cope up. I am very amateur in excel, but thanks to a certain website which referred your website to me. Now I'm learning... bit by bit. I tried to follow your instructions, but when I copied the formula it says, "Reference Not Valid". Could you help me where I went wrong? Thanks so much! I tried to create this on top of a pivot table, but did not work. Pivot table will help me refresh the data on the chart as and when data set changes. Is that possible ? Hi, Thank you for this great tutorial. I am unable to recreate this with pie charts though. Tried a lot of stuff, but just bnot getting my head around using checkboxes and generating pie-charts like these bar-graphs. Please help.